Nestled in the heart of Montreal’s business district, on the 46th floor of an emblematic tower, Observatoire Place Ville Marie offers an breathtaking view of our metropolis and its main attractions. Live a unique experience more than 185 meters above the ground. 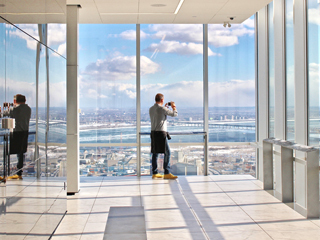 Its inspiring space, its 360° panoramic view, its incomparable oversized windows, its spacious terrace on the 44th floor that vibrates to the rhythm of Montreal’s 4 seasons and its central location makes Observatoire Place Ville Marie a must. Enjoy a gourmet stop at les Enfants Terribles, the highest restaurant in Montréal!